Whole of House Bad Taste & Odour Water Filter System for low sediment town supply. 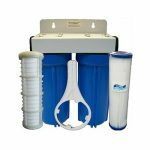 Large flow rate filter ideal for most situations where water quality needs to be improved in town applications. 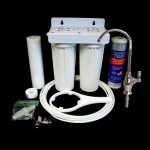 This package contains a Big Blue filter housing with 1″ Bsp threaded inlet & outlet ports a white steel bracket with a housing spanner for undoing the filter sumps. 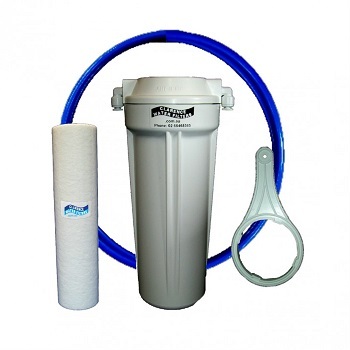 The filter is a granular coconut carbon refillable filter with sediment filter pads at each end. 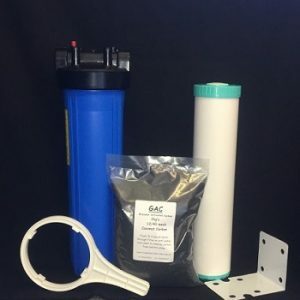 GAC carbon will reduce Chemicals, Chlorine, Organic Compounds, Thrihalomthanes, Fall out from over spray, Bad Taste and Odours greatly improving your water quality. This package comes with one full carbon filter and one 2kg refill of carbon. To replace the carbon simply remove the cartridge, unscrew the top end cap off and empty out old carbon, wash the cartridge and sediment pads or replace as required. Refill with new carbon, replace end cap, install and flush lines to remove any carbon fines until clear. As a guide you should usually change your carbon every 6 months but this can vary with water quality and usage. 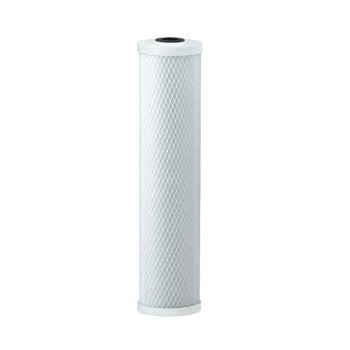 If bacteria is a problem it’s recommended to install an end of line drinking water filter at the sink with a cysts rated cartridge. 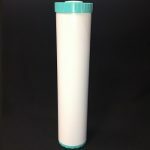 For a small investment you will be surprised at the difference these filters will make to your water quality. If this system is not the one your are after just contact us for more options.